Off to Market! - Stop staring and start sewing! Thank you all so much for the nice comments about my hair! I have fresh polish on my nails and just made my last trip to the post office (at 12:10 am!). 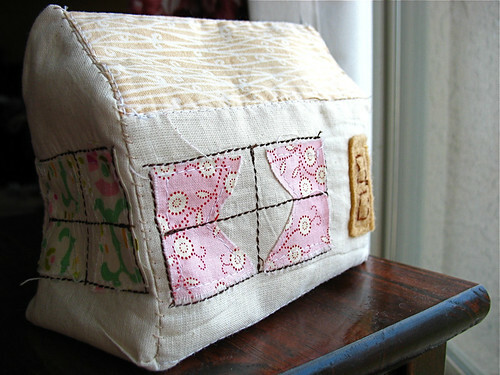 I've been sewing samples like crazy for Quilt Market and it's really been fun but tiring. I finally got to play with Heather's new line (which is debuting this weekend) and I can't wait to share the pictures. But it's all top secret and hush-hush for now. I also made it a little crazier by sewing some things to sell for quick cash and I'm thankful that I'm going with enough money for all the coffee I can drink and all the Burgerville burgers I can eat. Joey took me shopping for a few more things and I found the nicest jeans at J. Jills. I honestly started tearing up in the dressing room when I tried these jeans on. They are so comfortable and flattering and I felt like my life's quest for great jeans was finally achieved. I was a little (a lot) shocked by the price but the gal at the counter said she's been wearing hers for 4 years and loved them and Joey was willing to pay so what the hay! 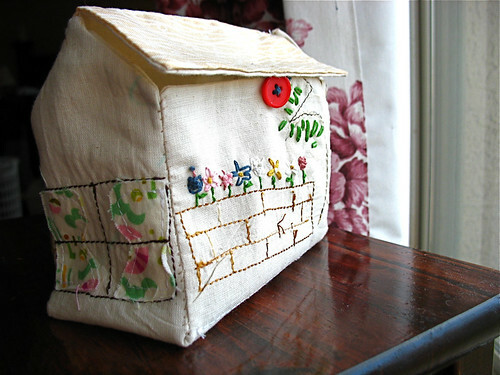 I got some sweet things for Mother's Day and I wanted to share this adorable house Olivia made for me. She got the pattern online but I'll have to ask her where. I love this flower garden. I'm off to finish packing and get maybe 3 hours of sleep. I can't wait to see all the new stuff at Quilt Market and I hope to get lots of pictures!! Oh and the weather is supposed to be beautiful! Yip yip!